UN – The UN refugee agency (UNHCR) has begun relocating nearly 15,000 South Sudanese refugees who had been stranded for a few months at a way station in western Ethiopia after the refugee camp where they were due to live was flooded. In a press release today, UNHCR said that a first group of 125 refugees left Matar Way Station on Monday and headed along the Baro River to the Itang Transit Centre, where they spent the night before resuming their journey today by road towards Pugnido Refugee Camp, some 300 kilometres away. The refugees are expected to reach the camp – home to some 45,000 mainly South Sudanese refugees – later today. A further 29 refugees with special needs, including pregnant women, lactating mothers, the blind and older people, will be flown to the camp by helicopter, UNHCR said. The International Organization for Migration (IOM) had chartered two boats for the trip – one for passengers and the other for luggage. The refugees were provided with water, high-energy biscuits, and relief items such as blankets as they boarded the boats wearing life jackets, UNHCR said. Upon starting the trip, one of the refugees – 26-year-old Nyapal – said: “I'm glad that we are leaving this place. I have never been happy here. Now I can smile again.” Nyapal, who flew on the helicopter to the Pugnido Refugee Camp, arrived at Matar pregnant with her first child after fleeing the violence in South Sudan. 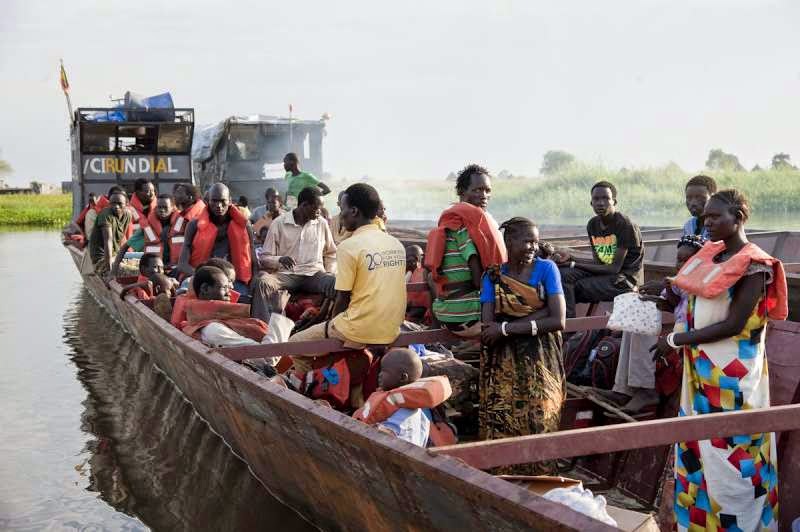 The refugees had been stranded at Matar, which is close to the border with South Sudan, after heavy rains and floodwaters from the Baro River swamped the Nip Nip refugee camp, where they were originally destined to live. The floods also made access roads impassable. Valentin Tapsoba, UNHCR’s recently appointed representative in Ethiopia, was present at the launch of the operation and thanked the Government and people of Ethiopia for taking in the refugees and sharing their resources. Mr. Tapsoba also presented two four-wheel-drive vehicles and an ambulance to the Government’s Administration for Refugees and Returnees Affairs for the relocation. More than 190,000 South Sudanese refugees have sought refuge in Ethiopia’s Gambella region since conflict broke out in South Sudan in mid-December 2013, UNHCR said. Some 100 refugees continue to cross into Ethiopia every day, mainly through the Burbiey border point from Jonglei and Unity states in South Sudan. The new arrivals cite food shortages and insecurity, including sporadic fighting between rival warring factions, as reasons for their flight, the agency said. Ethiopia is currently Africa’s largest refugee-hosting country, with more than 600,000 refugees. UNHCR is working with the Government of Ethiopia to find land where some 50,000 flood-affected refugees can be relocated.